With the optional AETA Remote Access feature, you can control all the parameters of your codecs remotely and in real time via the Internet, including via 4G mobile networks. The system allows you to control the remote unit from the HTML server well known to AETA codecs users, and so far accessible on local network (LAN). The AETA “Double Streaming” system is an efficient way of strongly increasing the robustness of an AoIP link, thanks to a redundant link that can compensate for losses on the main link. Audio transmission over IP (AoIP) is indeed sometimes subject to data losses for various reasons (network congestion, signal loss or temporary interruptions). Double Streaming relies on setting up two SIP links, simultaneous but via two separate routes: In addition to the “main” SIP link, a “secondary” SIP link is set up between the units. This link transports a copy of the audio stream of the main link. On each codec, a specific transmission interface can be selected for each of the two AoIP connections. In this way two independent routes are created, whose possible losses are not correlated. The codec which receives the two (normally) identical streams recombines them, discarding the duplicates. The system works on a normal SIP architecture, and is compatible with any SIP server. Like for a normal SIP link, it is also possible to make links without a SIP server. All AETA codecs offer an RTP transmission mode with enhanced reliability, using packet replication. When enabling this mode, every packet is transmitted twice; with such system a lost packet has no effect since the receiver still gets the other copy of the packet. In this way, stable links can be obtained even with a high packet loss rate. Of course, as a disadvantage the bit rate is double; you must make sure this stays compatible with the transmission medium. All AETA codecs operating over IP are able to use the SIP protocol. Using a SIP server greatly simplifies the setting up of a connection. AETA has set up a public SIP server, dedicated to Audio via IP broadcasting applications. However, “Direct RTP” mode allows you to setup an audio call over an IP network without using the Session Initiation Protocol (SIP). Please download this application note to see how to operate the codecs using the “Direct RTP” mode. 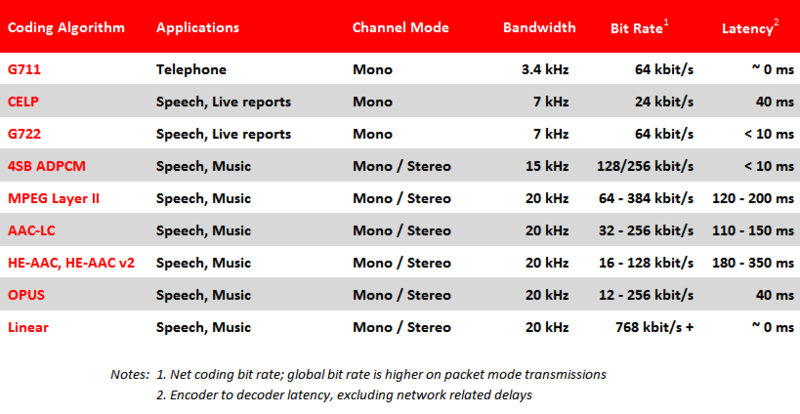 With the double mono codec option, ScoopTeam, Scoop5 S and Scoop5 S-IP have the ability to function as two mono codecs over IP, each with its own SIP registration. This feature allows you to establish two independants links toward two different destinations. All AETA codecs operating in IP have a built-in HTML server for setting device parameters. Accessible on a local network from a computer, it is also accessible remotely from a simple Internet connection thanks to the AETA Remote Access option. For supervision needs, a management system can make use of SNMP (Simple Network Management Protocol) for accessing the essential features and status of the units. Trap messages can be configured for the most relevant events. Multicast is an IP networking technology that provides one-to-many communications between a source and many different recipients. 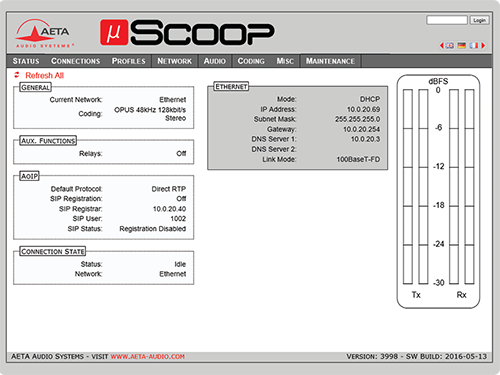 The multicast function is available on the following AETA codecs: MultiScoop, μScoop, Scoop5 S, Scoop5 S-IP. HD Voice delivers higher quality voice transmissions by extending the frequency of range of traditional or narrowband voice calls (300 Hz to 3400 Hz) out to wideband audio ranges (50 Hz to 7000 Hz). The 7 kHz wideband sound quality allows the full signature character of the reporter’s voice to be heard, leading to greater audience involvement and loyalty. Look for more about HD Voice in our FAQ page. Setting an ISDN connection is often difficult, at least because of the numerous coding parameters to be set. Moreover, with most proprietary algorithms, it is mandatory for the two devices to have exactly the same settings, otherwise the connection will fail, and sometimes it is not easy to find out the reason. 5A stands for AETA Audio Advanced Automatic Adjustment. This system makes it easier to set an ISDN connection, because the codec, on receiving a call, automatically adjusts itself, following the calling party algorithm and parameters. When the 5A System is enabled on the unit and a call is received, the unit first detects the coding algorithm used by the calling codec, and also senses its parameters: audio mode (mono, stereo…), sampling rate, bit rate, inverse multiplexing protocol, etc. Then the unit can decode the compressed audio from the remote unit. In addition, the unit will use these same settings for encoding and sending audio to the remote unit, so that the remote unit can also decode the outgoing audio program. The whole process just takes a few seconds. Of course, all compatible coding configurations can be detected automatically by the 5A System. Note that the 5A system is only active for ISDN connections. The N/ACIP UER Tech3326 is an EBU recommendation for interoperability of audio codecs over IP. The EBU recommends in particular the use of SIP and SDP protocols, as well as a minimal set of supported coding algorithms. Our IP Audio Codecs are all compliant with this recommendation, and able to interoperate with several other brands.